Bond funds or fixed income funds are another less volatile investment vehicle for investor to diversify its investment portfolio. There are two main fixed income mutual funds: taxable bond funds and non taxable bond funds (Municipal Bond funds). This article will provide one of the top municipal bond mutual funds. This muni bond fund can provide regular dividend or income for investor. It is also an efficient way for high income investor to diversify its portfolio. The Ivy Municipal High Income fund’s objective is to seek a high level of current income that is exempt from federal income tax. This Muni bond fund invests most of net assets (>80%) in a diversified portfolio of tax-exempt municipal bonds. It invests in bonds rated in the lower tier of investment grade or lower, including bonds rated below investment grade, or junk bonds. The fund typically invests in municipal bonds with remaining maturities of 10 to 30 years. It also invests in investment grade municipal bonds at times when yield spreads are narrow and the higher yields do not justify the increased risk. Michael J. Walls is the fund’s manager of this high yield muni bond fund since its inception in May 2009. This fund is new, but the Institutional class of this fund (WYMHX) was introduced to public in December 1998. The expense ratio of this fund is 0.94% for Class A and 0.70% for Class I per year. This fund has 0.25% of 12b1 fee and 4.25% front-end sales load fee. As part of High Yield Bond, this fund shares 4.69% dividend yield. The dividend is distributed on monthly basis. The last dividend distributed was in July 2011 ($0.02). 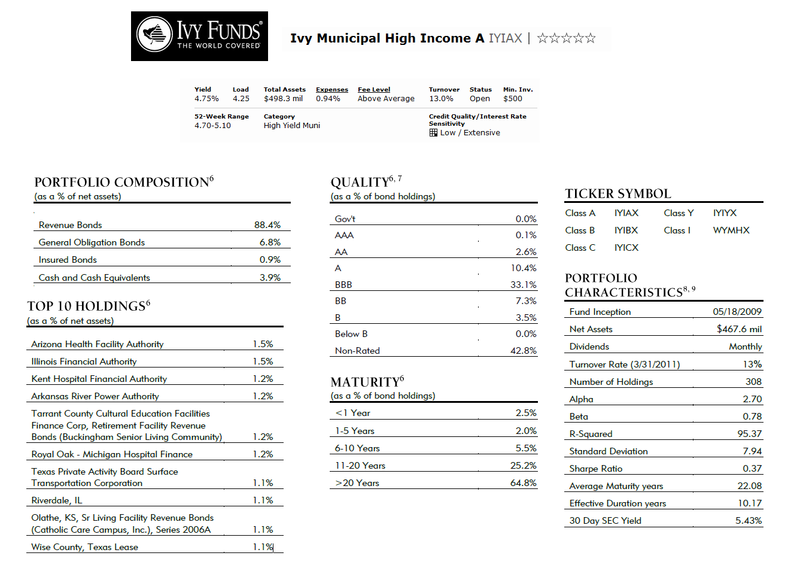 This Ivy Municipal High Income Fund has 5-stars rating from Morningstar. It is also listed as one of the top fund in the US News Best Mutual Funds list. This top rated fund received 5-stars for 3-years, 5-years and 10-year period. The YTD return of this fund is 5.74%. Based on the load adjusted return, this top fund has returned 0.01% over the past year and 3.83% over the past five years. The first year performance of this year (2010) was 6.69%. This Ivy Municipal High Income Institutional fund (MUTF: WYMHX) has 5.86% YTD return and has returned 5.44% over the past decade. This Ivy fund can be purchased from a selection of 35 brokerages, like JP Morgan, Scottrade Load, Shwab Institutional, Wells Fargo Advisors MF Advisory, Raymond James, Ameriprise SPS Advantage, Pershing Fund Center, etc. The minimum initial balance to start investing in brokerage account of this fund is $500 with no minimum subsequent investment. Besides Class A and Class I, there are other classes available as well such as Class B (IYIBX), Class C (IYICX) and Class Y (IYIYX). As of June 2011, the top 10 holdings of this best muni bond fund out of 308 total holdings are Arizona Health Facility Authority (1.5%), Illinois Financial Authority (1.5%), Kent Hospital Financial Authority (1.2%), Arkansas River Power Authority (1.2%), Tarrant County Cultural Education Facilities Finance Corp, Retirement Facility Revenue Bonds (Buckingham Senior Living Community) (1.2%), Royal Oak - Michigan Hospital Finance (1.2%), Texas Private Activity Board Surface Transportation Corporation (1.1%), Riverdale, IL (1.1%), Olathe, KS, Sr Living Facility Revenue Bonds (Catholic Care Campus, Inc.), Series 2006A (1.1%) and Wise County, Texas Lease (1.1%). According to the fund’s prospectus, the principal investment risks include Alternative Minimum Tax Risk, Credit Risk, Interest Rate Risk, Liquidity Risk, Low-rated Securities Risk, Management Risk, Market Risk, Political, Legislative or Regulatory Risk, Reinvestment Risk, Taxability Risk, etc.